Sir Charles Bell or Rabden? 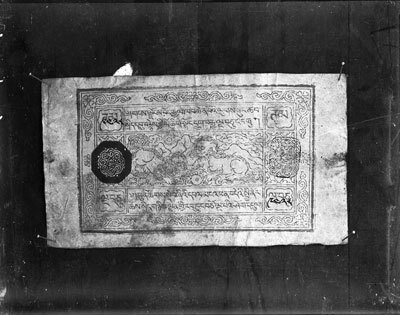 Tibetan currency note for 50 tangkas with figure of lion in centre, red seal on left and black seal on the right. Manual Catalogues - Bell's List of Illustrations entry: "[No. of chapter] XIV. [Subject of Chapter] Currency. [Subject of Illustration] Q51. (d) Tibetan currency note for 50 tangkas with figure of lion in centre, red seal on left and black seal on the right. [where placed - book page] I, 204. [Remarks] L.67"
Contemporary Publication - Published in 'Tibet Past & Present', Bell, C. A., Oxford: Clarendon Press, 1924, facing p.204:"A currency note"
The Tibet Album. "Tibetan currency note" 05 Dec. 2006. The Pitt Rivers Museum. <http://tibet.prm.ox.ac.uk/photo_1998.286.59.1.html>.